My dream – Where to go for a White Christmas for 2016 or 2017…. Who from the Southern Hemisphere wouldn’t like to experience a White Christmas right? That’s what I keep telling my sister and her husband when I am trying to talk her into taking a family holiday to experience a northern hemisphere Christmas. Once I win her over, I will mention it to the rest of the family and see if I can get some traction on this wild pipe dream of mine! I’ve told her I’ve made a hash tag for it so it has to happen, doesn’t it! Where is the best place to experience a white christmas? I’m working on the theory that if I start dropping hints about it now, when it comes time for putting forward cash for flights, it won’t seem like such a crazy idea. Don’t get me wrong, Christmases down under are awesome in the stinking heat, round the BBQ drinking beer and eating seafood cocktails (everyone except me as I don’t eat seafood) but its just not what you read about in all the books. I must admit though, I have had two Northern Hemisphere Christmases, one was white in Brackley, Northants and the other in London and I loved it. It was when I was backpacking back in 1994 and it started snowing at 11.30pm on Christmas Eve, as soon as some yelled its snowing I started crying. I think everyone in the pub thought I had gone mad. I think it would be a wonderful experience and something the whole family could enjoy. I have known other Aussies to do it and not just ones that have family overseas, I have known Aussies that have gone abroad just for the experience of a White Christmas. So why can’t we! At this stage, its all still a pipe dream so I have made a list of the top 3 places that I would love to make a reality. There not really in any particular order as I would be happy with any of them but I suppose if I had a choice, it would look something like what is below. New York at Xmas time. Of course New York is number 1, as its number 1 on every list I have! Don’t think we could afford 2 weeks there, so maybe a week in Salt Lake City or anywhere else with cheaper accommodation for the week of Christmas and then over to New York for maybe 5-7 days over New Year. Sounds awesome hey, who could say no! Whilst its expensive to get there, once you arrive the cost of living is fairly reasonable. Both flights and accommodation will be very expensive from Australia and there’s no direct flights so will require a stopover somewhere, most likely LA. maybe that’s not such a bad thing, a snappy stop for a 3 day Disneyland visit could be on the cards! We have our famous Myer Christmas windows here in Melbourne but I would love to take the kids to see the Macy’s Christmas windows. I would love for them to go ice skating outdoors in Central Park, they are all pretty good roller skaters so I’m certain they would pick it up fairly quickly. Spending New Years in Times Square is something the kids (and the rest of us) would never forget. By 2017, the kids will be 8, 10 and 13 so would be able to make it to midnight and see the New Year in with a bang. 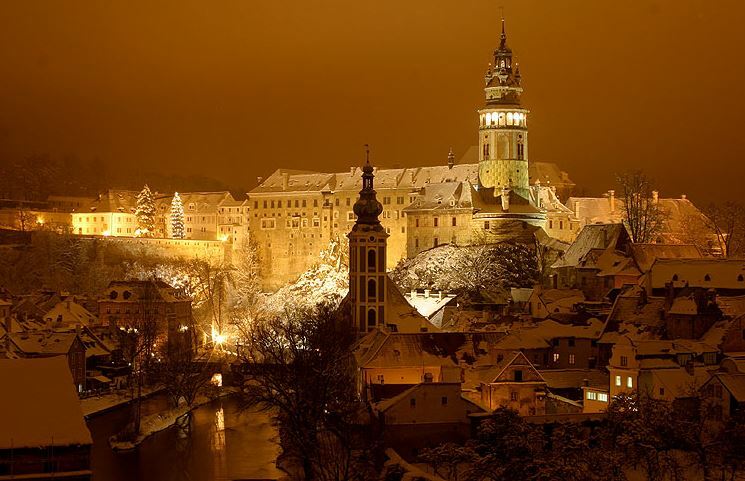 Cesky Krumlov – How can you not want to experience this! On all accounts all the reports coming out of there have been awesome, particularly Cesky Krumlov. Its cheaper than a lot of other European countries once you arrive and accommodation is very reasonably priced. As its not a direct flight from Melbourne we would have to consider a stop over in another European country and Paris would be at the top of my list. My girls have always wanted to go to Paris and a quick 3-5 night stopover will be sufficient to see what we would like to see. Maybe even consider Paris for New Years, now there’s a plan. This will be the same as New York though, expensive to get to but once your there our money would go further in the Czech republic. It also seems a shame to me, to spend all that money getting there and only spending a few weeks before returning. That’s something we would have to consider closer to the time. Prague is famous for its Christmas markets, the Old Town Square is the prettiest and the busiest and generally runs from the end of November until New Year. You will be able to purchase various handmade Christmas decorations, traditional Czech Christmas cookies, traditional Czech purpure (Christmas pot pourri), traditional Czech Christmas food and hot mulled wine. Click here for some Prague inspiration. Osaka covered in snow – what a beautiful sight. Now last but by no means least is Kyoto or Osaka, Japan. It would of course be the cheapest to get to from Melbourne but is much more expensive on the ground. I have chosen Kyoto as I have always wanted to see the Geishas and Kyoto is the place to see them. May as well kill two birds with one stone. Accommodation is a little more expensive then the other 2 options but I’m sure with the 2 years I have to plan it I can find something reasonably priced. Osaka has a lot of tradition and culture and is not as big or busy or expensive at Tokyo, it also gives me the opportunity to catch the bullet train and get the famous Mt Fuji photo from the train window. Christmas Day is not a holiday in Japan, the Japanese tend to celebrate with dinner out on Christmas Eve but on Christmas Day life continues and the Japanese return to work. Christmas is considered more of the romantic celebration as opposed to how we celebrate Christmas. Trip advisor also advises that you can not be certain to get a white Christmas in either Kyoto or Osaka. In all honesty, going by what I have researched Japan isn’t a great option, it might provide a white Christmas but as far as atmosphere goes, this is not a Christmassy place. Now this is by no means a final list, I would love to hear other peoples opinions and suggestions of places they have spent or would like to spend a Christmas. I suppose the next step is to start working out how much all this is going to cost. I’m tipping the flights will be the biggest outlay, accommodation is easier as I am quite happy to forgo 5* for something more affordable and would love an apartment so that we could still cook a Christmas meal. Please leave your comments below, I look forward to reading your suggestions. Read further updates here: Update #2 White Christmas, Update #3 White Christmas. New York is number one for me too!! Number two might be somewhere in Scotland. Prague sounds nice too. Yes Scotland would be nice too and Edinburgh for new Year would be pretty impressive! I’m working on it, its a big ask but I think they will come to the party! Oh I’m so glad to hear an opinion that has visited both. I’m secretly favouring Cesky Krumlov but would be happy with either! Gosh I sure hope I can make it happen, I don’t do Christmas without my sister so I’ve got to work on her! You guys have an awesome Christmas, we are off camping to Marysville, haven’t been there since before the 2009 Black Saturday bushfires so really looking forward to seeing how much it has come along. Hi! You probably know all this from your travel back then but You must do a winter trip to Europe. It was magical! I would do it again! We went for 5 weeks but we went to many places. Hubby and I have a 3yr old now..we have holidays this Dec and are planning whether to have a summer or winter vacation. I came across your blog to get some ideas – I can’t decide where we can go in Dec – most places have bad weather then..For Europe I would also recommend while you are there – Neuschwanstein Castle, Lucerne, Paris, any Christmas markets. We would have loved to go to Prague – its on our list. We spent NYE in Paris – we had always been in Syd CBD watching the fireworks and partying the night away afterwards so were disappointed. But we are more open to celebrating NYE a diff way as we grow older hehe! On Christmas it so worked out that we happened to be Rome, Boxing Day I was standing in front of the Pope! awesome atmosphere even if you weren’t religious. Sistene chapel beautiful and Michelangelo’s work amongst other things and standing in front of the Pieta brought me to tears – and I wasn’t even a mother back then. Whatever you do, it’ll be an experience. I would also suggest buying quality Merino and pure woollen clothes, socks – I have Kathmandu items and they are still going after all these years. Hi Jaya, thank you for the great information and I am so glad you found my blog. The plans for Christmas 2017 are ongoing, we have scratched Japan from the list as we are heading there next year for a girls trip during the autumn. For a while there is was looking like Chicago for christmas and New York for New Year. This has changed as recently as Sunday and now the plan is back in Europe, most likely Germany or Prague or Tallinn! A friend at work suggested Wcrokow, Poland so really we are back at the drawing board! Lucky I love the planning hey!Thanks so much for your information. Rome would also be amazing so that might just have to go on the list! Thanks again. and I have been to Japan – Love it! Love it! Love it! We went in May – weather was perfect. Missed the cherry blossom but spring or autumn perfect time to go. great for family as well. Not sure about winter – most people i know have been there for skiing during winter. i think your kids will love it in the other seasons. they maximise their space – so be prepared for small size hotel rooms. Must see place – Takayama, Kyoto, Tokyo, stay in a traditional ryoken for the experience. I didn’t enjoy Osaka – did a day trip only. $ comparable to travelling in Syd – better quality food, etc. Let me know if you want other tips re accom or anything. The plan is to hit Japan in about Sept next year, we would do Tokyo, Kyoto and Hiroshima for a day trip. The cherry blossom season is short lived and expensive so I decided that autumn would be lovely there too so that is what we think we will aim for. I would really love to see geisha so we will head to Osaka for a few nights. Hiroshima would be a great day trip, we are taking my oldest daughter so we are really looking forward to it. I have wanted to go there since I was in high school and I am beyond excited about finally making it there, wish I still had the details for my pen pal! Thanks again for you information, when we start planning I will get in touch for some tips.